Glass half full or empty? The upward mobility of some minorities suggests a pretty open society. But even for the successful there are still ethnic penalties in pay and employment with ‘glass ceiling’ issues in higher status jobs. 1. How open is the British job market? 2. What kind of jobs do minorities do? Men from Chinese and Indian backgrounds are almost twice as likely as their White British counterparts to be in higher managerial jobs. 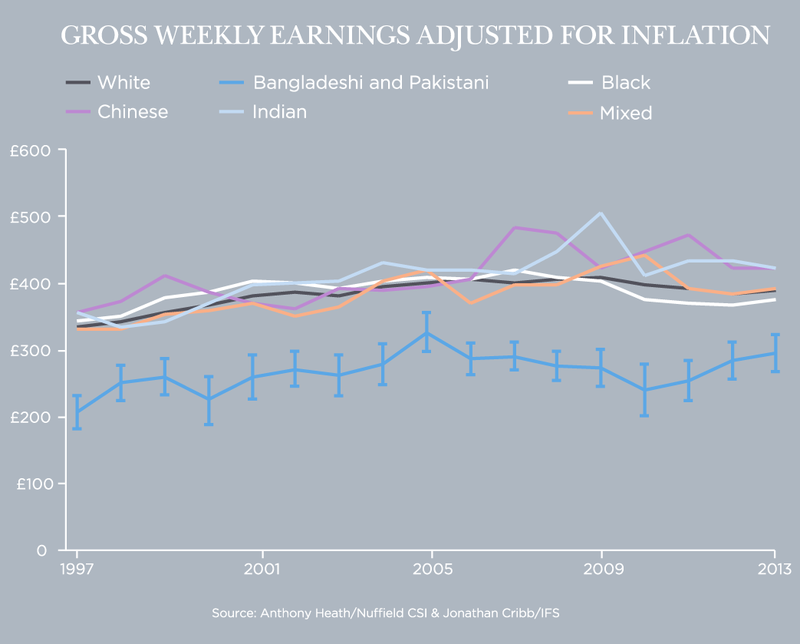 But ‘ethnic penalties’ in pay, and especially employment, persist at varying levels for all minority groups and more than a third of Bangladeshis and Black Caribbeans work in the lowest skilled jobs. In many of the most visible ‘public service professions’ – such as politics, the judiciary, the police, the armed forces and teaching – and in business boardrooms, minorities continue to be under-represented, especially at higher levels. In some professions, particularly medicine and law, minorities are over-represented. Despite declines in self-reported prejudice among white people there is a persistent bias against employing people who do not have obviously white names. Ethnic minority households are more likely to be poor: 24.1 per cent are compared with 13.5 per cent for the White British. Partly for that reason ethnic minorities in general are more likely to receive welfare benefits. One indicator of how integrated Britain is becoming is how much mobility and convergence in occupational outcomes there is for different groups. So, how are different ethnic groups represented in the main eight-tier occupational class system as defined in the 2011 census of England and Wales? 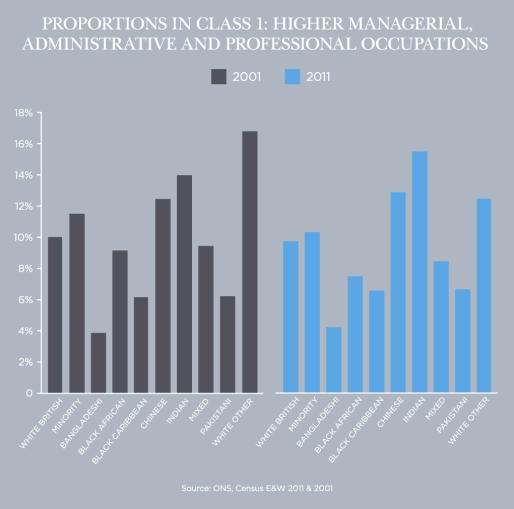 In class 1 – higher managerial, administrative, and professional occupations – there is little to distinguish the White British from ethnic minorities: 9.8 per cent of White British are found in class 1 compared to 10.3 per cent of minorities. However, some ethnic minorities are better represented than others. For instance, 15.4 per cent of Indians are found in class 1 while only 6.6 per cent of Pakistanis and 4.2 per cent of Bangladeshis are found there. Black Africans and Black Caribbeans also have lower proportions in this class (7.5 per cent and 6.2 per cent respectively). Only 4.7 per cent of the White British are found in the bottom ‘never worked and long-term unemployed’ category compared with 11.1 per cent of ethnic minorities. Pakistanis and Bangladeshis stand out in this class (in part because many Pakistani and Bangladeshi women choose not to work). The White British are more evenly spread and less concentrated towards the top and bottom than minorities. Black Caribbeans are slightly better represented in class 3, intermediate occupations. White Others and Pakistanis are better represented in class 4, small employers and own account workers, than the White British. Black Caribbeans have a greater proportion working in class 6 – semi-routine occupations – than the White British. According to a study by the Equality and Human Rights Commission (EHRC) Black African and Black Caribbean men are 50 per cent less likely to be employed in managerial jobs when compared with the overall rate for men. Only one in ten Black African men and Black Caribbean men are employed in managerial level jobs. In stark contrast, men from Chinese and Indian backgrounds are almost twice as likely as their White British counterparts to be in higher managerial, lower managerial or intermediate level jobs. According to recent research 43 per cent of Indians work in the highest skilled professions while 35 per cent of Bangladeshis and Black Caribbeans work in the lowest skilled jobs. Those who cannot speak English are more likely to be found in elementary and skilled trades while those who speak it as a first language and those who have it as a second language but speak it well are more likely to find their way into the professions. Those who speak English as their first language and those who speak it to a high level as a second language are roughly equally likely to be in white collar jobs. 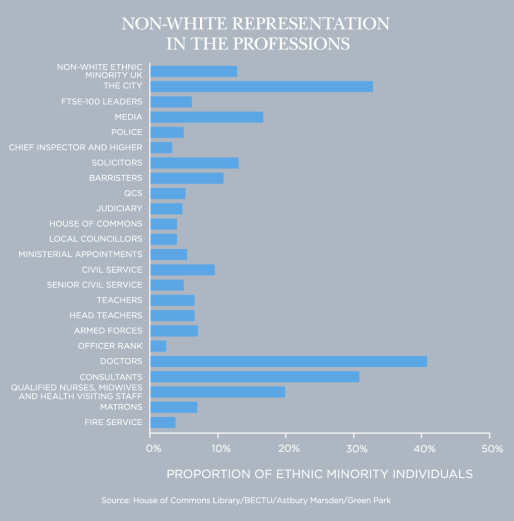 Ethnic minority representation varies from profession to profession. In many of the most visible and important public sector professions they are often under-represented, especially at the highest levels. In others, most notably in healthcare, they are over-represented. Just 5 per cent of the police force are from non-white ethnic minorities. However at chief inspector and higher ranks this figure is 3.3 per cent. The judiciary is 4.8 per cent non-white, while teachers are 6.2 per cent. Head teachers have a slightly higher proportion at 6.6 per cent. The armed forces are 7.1 per cent non-white but officers are only 2.4 per cent non-white. In the fire service 3.8 per cent are non-white. Among doctors, ethnic minorities are over-represented: 41 per cent of doctors are from an ethnic minority, the majority being Indian or White Other. However, they are less well represented among consultants (31 per cent). The proportion of qualified nurses, midwifes and health visiting staff stands at 20 per cent but nurse consultants are only 6 per cent non-white while matrons are 7 per cent. The civil service is 9.6 per cent non-white, but senior positions within the civil service are 5 per cent. More than one in five (22 per cent) of solicitors are non-white, but only 10.9 per cent of barristers and 5.27 per cent of QCs are from non-white ethnic minorities. Non-white ethnic minorities made up around 40 per cent of trainee solicitors in 2012, and therefore the UK may see a rapid change in the ethnicity of its legal professionals in the coming years. However, as it stands, non-white minority solicitors are more likely to work in small, local firms, and tend to make less money than their White British counterparts. In professional football, black (and mixed race) people have achieved a substantial over-representation – 25 per cent – but are under-represented at managerial level. Read more in our section on sports. The City is one of the most diverse places to work in the country. In 2012 research by Astbury Marsden found that 59.1 per cent of its workforce were ethnic minority. Many of the non-White British are however still white – 26.5 per cent of city workers are White Other. Even with these stripped out, the City is still highly diverse with one third being visible ethnic minorities, many of them non-British. Indians are the best represented non-white ethnic group at 12.3 per cent of the city work force. 3.9 per cent are Chinese while the proportions of Black Caribbeans, Pakistanis, and Bangladeshis are small. By contrast the boardrooms of Britain’s leading companies remain much less touched by ethnic diversity. Research by Green Park found that of the top 3 jobs within leading FTSE-100 companies (Chairs, CEOs, CFOs), nearly all were filled by white people while there were no East Asians whatsoever. When we look at the top 20 jobs (board and main executive directors) the proportion of non-whites stands at 6.4 per cent. 62 out of the FTSE-100 companies had all-white main boards. Broadly speaking people from ethnic minorities work in the same sectors in similar proportions to the White British population. The three largest industry groups in which the White British work are ‘Wholesale and retail trade; repair of motor vehicles and motor cycles’, in which 16.1 per cent work, then 12.2 per cent work in ‘Human health and social work activities’ (doctors, nurses, social workers, carers etc) and 10.2 per cent in ‘Education’ (teachers, lecturers, driving instructors etc). 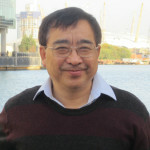 Ethnic minorities are slightly less well represented in ‘Wholesale and retail trade; repair of motor vehicles and motor cycles’ related industries with 15.1 per cent and they are also slightly better represented in ‘Human health and social work activities’ (14 per cent) and less represented in ‘Education’ (8.5 per cent). Similar differences between ethnic minorities and the White British are also found in the sectors ‘Construction’ (builders, engineers, painters, plasterers etc) and ‘Accommodation and food service activities’ (hoteliers, restaurateurs, waiters, chefs etc). In the former, the White British outweigh ethnic minorities by 3.3 percentage points while in the latter ethnic minorities are better represented by 4.7 percentage points. For Indians the most common group is again ‘Wholesale and retail trade; repair of motor vehicles and motor cycles’ where they are significantly better represented than the White British (20.2 per cent). The same is also true for Pakistanis (21.8 per cent). There is also a substantial proportion of Pakistanis working in ‘Transport and storage’ (13.6 per cent), which includes taxi driving. The most common industry group for Bangladeshis and Chinese is ‘Accommodation and food services’ (27.3 per cent and 26.7 per cent respectively). For Black Africans and Black Caribbeans it is ‘Human health and social work activities’ (26.6 per cent and 19.6 per cent respectively) – note that this is much greater than the proportion for White British in this category (12.2 per cent). These differences can be explored geographically using our economic activity map. Research by the Joseph Rowntree Foundation looked into the extent of segregation within the major occupational groups. It was found that all ethnic minority groups had much larger concentrations within certain sectors than the White British, who tend to be much more evenly spread out in the labour force. The EHRC noted that there are some cases where ethnic groups are especially concentrated within one sector; for example, 25 per cent of Pakistani men are taxi-drivers. Policy Exchange research has found that nearly 50 per cent of Bangladeshi men work in restaurants. Both Black Africans and Caribbeans are highly represented in the public sector. Immigrants (as distinct from minorities) are over-represented in low-skilled jobs. They make up 27 per cent of the workforce in the food production and hospitality sector and 19 per cent of factory workers. In the meat and poultry processing industry about one-third of the permanent workforce and 70 per cent of all agency workers are immigrants (according to an EHRC report of March 2010 some companies segregate shifts or production lines by nationality and language). Surprisingly little work has been done on ethnic mixing in the workplace or on attitudes to ethnic difference. However, research by Rob Ford found that there had been steady declines across time in the proportion of White British people objecting to having an ethnic minority boss. In 1983, the proportion of White British people who were bothered by having an ethnic minority boss stood at around 20 per cent but by 1996 had dropped to around 14 per cent. In 2006, 8.2 per cent of white people objected to having a black boss, while 9.7 per cent objected to having an Asian boss. In 2006, the British Social Attitudes survey asked respondents how similar their most immediate co-workers were; 37 per cent of white people compared with 2 per cent of non-whites said their closest colleagues were all white. Non-white people were much more likely than white people to be working in environments where there are similar numbers of white and non-whites: 45 per cent compared with 18 per cent. Only 4 per cent of non-whites were working in ethnically homogenous workplaces. In the same survey people were also asked if they were prejudiced against Asian or black colleagues; 17 per cent of white people compared with 30 per cent of non-whites admitted to having either a lot or a little prejudice against Asian colleagues, and 13 per cent of white people compared with 24 per cent of non-whites said they had either a lot of or a little prejudice against black colleagues. This survey implies either that non-white people are more prejudiced against other ethnic minorities than white people or that they may be more willing to admit to having such attitudes. According to a study of qualified nurses in 2005, there seems to be some segregation in the shifts that nurses work. It was found that UK-qualified minority nurses were more likely to be working rotating shifts and less likely to be working day shifts than their white UK-qualified counterparts. In 2014 post-1984 migrants made up half of the workers in the worst paying 20 per cent of London jobs. One in five workers in low-skilled occupations are non-UK born; in 2011, of migrants born in EU A8 countries (those, including Poland, that joined the EU in 2004), 38.3 per cent were in low-skilled jobs and only 7.8 per cent were in high-skilled ones. These proportions are reversed for migrants from other EU countries working in the UK. It is important not only to ask what jobs people have but also whether or not they like doing what they do. Policy Exchange found that white people had the highest levels of job satisfaction while Bangladeshis and Black Africans were the most dissatisfied with their work. The Business in the Community Initiative’s Race at Work 2015 report gives us some useful survey data on how different ethnic groups experience work. However, their findings must bear the important caveat that the working populations or each ethnic group have different demographic compositions with ethnic minority groups in particular tending to be younger. There will also be differences that in part may be accounted for by ethnic concentration in particular occupations. Non-white ethnic minorities tend to enjoy their work slightly more – 65 per cent compared to 61 per cent for whites; enjoyment is highest among Asians (67 per cent) while for black and mixed ethnic people the proportion is much closer to the white majority. When it comes to treatment at work, some groups do not feel they are treated fairly by their managers, with whites coming close to the top of the complaints list. For instance, 26 per cent of Pakistanis and 31 per cent of Indians as well as Bangladeshis disagree that managers treat them fairly compared to 39 per cent of white people. However, for Black Caribbean people the proportion is marginally greater at 41 per cent. Non-white ethnic minority employees are more likely to feel they have been unfairly passed over for promotion although again there are strong differences between groups. 35 per cent of Pakistanis feel they have been unfairly treated in their career progression as do 33 per cent of Indians, 29 per cent of Bangladeshis. For Black Africans and Caribbeans, it is around 3 in 10. This compares to 23 per cent of whites. Non-white people tend to have greater ambition; 64 per cent agreed it is important to progress in their career compared to 41 per cent of whites. Many non-whites report racial harassment at work: 28 per cent say they have witnessed or experienced racial harassment or bullying from managers in the last 5 years while 32 per cent report it from colleagues. The most reports come from Pakistanis and Bangladeshis with around one in four reporting they had personally been racially harassed or bullied. Race at work is something that many people find difficult to talk about. 58 per cent of white people say that their colleagues are not comfortable talking about race at work compared to 66 per cent of non-whites. How we address these differences varies by sector with some sectors taking diversity more seriously than others. 39 per cent of workers in finance and also legal professions say there is someone within their occupation who actively promotes equality and diversity. The proportions are much lower in hospitality and leisure (23 per cent), transport and distribution (22 per cent). The extent to which we deploy our full range of skills also varies from ethnic group to ethnic group: 59 per cent of Indians feel their job makes the most of their skills compared to 58 per cent of Pakistanis and 57 per cent of white people. For Bangladeshis, the proportion is as low as 43 per cent. There are many different ways in which to get a job and ethnic groups tend to approach this task differently. For instance, 73 per cent of whites believe that previous work experience will help in getting a job while for Pakistanis and Bangladeshis the proportions are lower at 50 and 59 per cent respectively. Notably, Pakistanis are more likely to believe luck plays an important role in getting a job – 26 per cent compared to 12 per cent of whites. Most immigrants, apart from highly skilled professionals, suffer some labour market disadvantage compared with similarly skilled White British people in both pay and employment. This is likely to be the result of a combination of factors: lack of cultural and linguistic familiarity, lack of networks, the (poorer) places where immigrants settle, inability to apply skills learnt in another place, and conscious and unconscious discrimination against outsiders. Language ability has been found to account for between 17 and 26 per cent of the pay and employment ‘gaps’ experienced by first-generation migrants (please also see our section on language). As immigrants become second or third generation minorities the disadvantage declines but the time it takes to catch up, or in some cases overtake, the majority norm at work, varies by ethnicity. Convergence rates are fastest for immigrants from European countries. If they are in employment most ethnic minority groups who are born and raised in the UK have considerably better chances of accessing professional and managerial level jobs than their first-generation immigrant parents. However, many remain concentrated in low-skilled jobs in sectors such as catering and hospitality and therefore second-generation ethnic minorities in general are still worse-placed than their White British counterparts in the broad occupational categories. Using Labour Force Survey (LFS) data for 1994–2000, after adjusting for age and education, Heath and Cheung found significant increases in male and female unemployment rates for Black Africans, Black Caribbeans, Pakistanis, Bangladeshis and, to a lesser extent, Indians over the period. These rates were as great for the second generation as they were for the first. In a study encompassing a wide range of surveys from 1973–2004 the same academics found a slightly decreased ‘employment penalty’ for the second generation, but concluded that ‘colour’ was likely to be a major underlying factor in such ethnic penalties. Once adjustments are made for age, education and region, a pay gap persists between the White British and the main ethnic minority groups – this is known as the ‘ethnic penalty’ and, as we have seen, it applies also to employment. Differences between ethnic groups are presented in the graphs below. Heath and Cheung found that UK-born ethnic minorities experienced significantly lower employment rates, wages and occupational attainment unexplained by variables other than ethnicity. ‘Ethnic penalties’ affected men and women of Black African descent particularly strongly while Chinese and Indian minorities competed relatively equally with White British employees. Pakistanis and Bangladeshis have been significantly lagging behind all other ethnic groups for some time, according to research by Anthony Heath and Jonathan Cribb. Between 1997 and 2013, their earnings were approximately 70 per cent of white earnings. There is some variance in the ethnic penalty across sectors and it is markedly lower in the public sector. Heath and Cheung concluded: ‘ethnic penalties tended to be larger in medium and large establishments than they were in small establishments’, this was possibly related to ‘the presence of co-ethnic employers in small establishments’. The problem with much of the research that focuses on employment opportunities and pay is that it does not differentiate between ethnic minorities and recent immigrants. Of course it is important to look at ethnic minorities as a whole but the problem is that as immigrants settle and make gains, these gains are offset by new arrivals who are just starting out. When Dustmann et al looked only at the differences between White British and UK-born ethnic minorities the differences were much less pronounced. Again controlling for age and education, the difference between UK-born Pakistani men and White British men was 20.3 per cent while that between UK-born Bangladeshi men and White British men was 14.7 per cent. 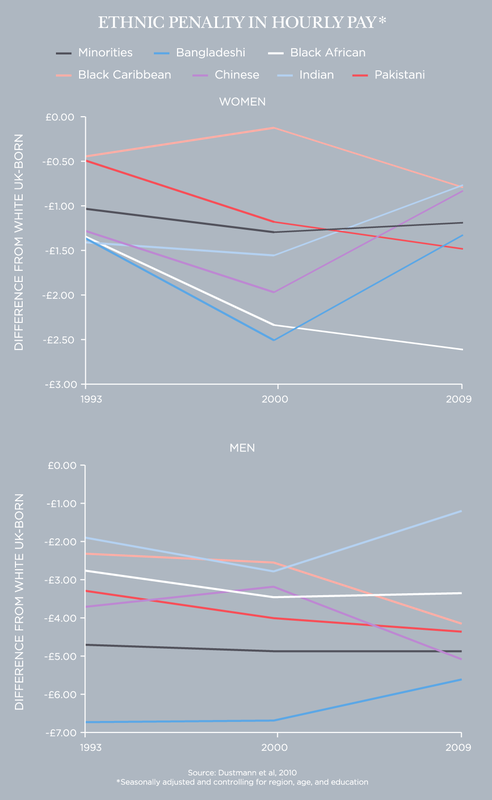 Notably, all differences between ethnic minority women and White British women disappear once immigration status, age and education are taken into account. Research from Policy Exchange found that Pakistanis and Bangladeshis were much more likely to report earning below the minimum wage – 29 per cent of Pakistanis and 32 per cent of Bangladeshis reported earning below the minimum wage compared with 14 per cent of white people. However, a recent article in the Economist showed that Bangladeshi and Pakistani incomes from employment between 2010 and 2013 had increased or remained constant at the same time that incomes for all other ethnic groups had declined. The reason put forward for this was the increasing number of Bangladeshi and Pakistani women entering into employment. Some non-white groups are more likely to be working for less than the living wage – differences are most pronounced when we look at men. Research by Malcolm Brynin and Simonetta Longhi found that 57.2 per cent of Bangladeshi men, 38.7 per cent of Pakistani, and 20.2 per cent of Indian men earned below the living wage. For white men, it was 15.7 per cent. For Black Caribbean men there was near parity at 15.9 per cent with Black African men at 20.9 per cent. 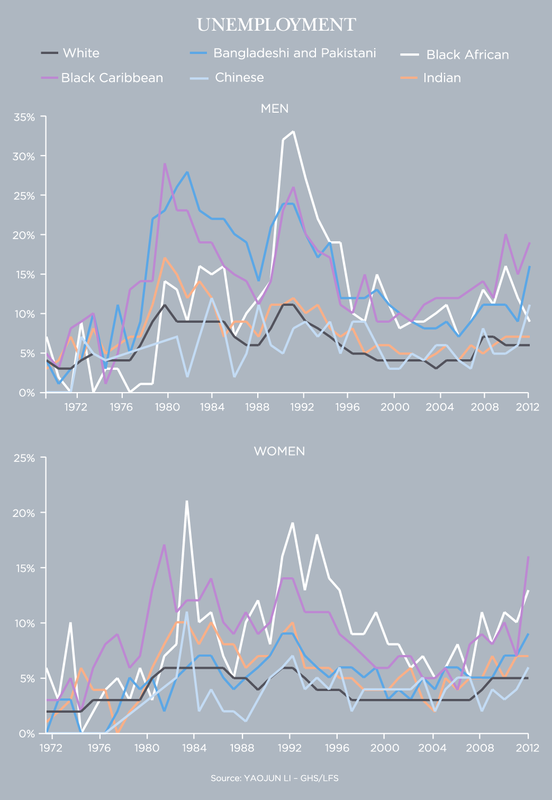 The differences between women are more interesting as some non-white groups are doing better than white women. So, 31.2 per cent of white women earn below the living wage and that compares with 37 per cent of Pakistani and 36.5 per cent of Bangladeshi women. However, 18.6 per cent of Black Caribbean and 24.6 per cent of Black African women earn below the living wage. Furthermore, 27.5 per cent of Chinese women are earning less than the living wage – near parity with Chinese men at 28.3 per cent. Some are more likely to move into low pay than others. Of those who earn more than the living wage, 15.7 per cent of Pakistani, 17.3 per cent of Bangladeshi, and 12.6 per cent of Black Africans move into low page. This compares with 7.5 per cent of the White British. Despite declines in self-reported prejudice among white people, there is a persistent bias against employing people who do not have obviously ‘white’ names. In 2008–9 NatCen Social Research conducted a test for racial discrimination in recruitment practices, sending 2,961 applications of equal quality for 987 advertised job opportunities. Having identified names associated with specific ethnic groups, it was found that 10.7 per cent of applications with a typically ‘white’ name received positive responses whereas 6.2 per cent of 1,974 applications with an ‘ethnic minority’ name received positive responses. This lead to the conclusion that 74 per cent more applications would have to be sent from ethnic minority candidates to achieve the same level of success. The level of discrimination was high across all ethnic groups (21–32 per cent), though it affected male job applicants to a greater degree (35 per cent) than women (26 per cent). Applications were submitted for a range of occupations and responses suggested that applicants can expect to experience lower levels of racial discrimination for higher-level vacancies. When anonymised application forms were used discrimination was virtually eliminated. Ethnic groups have different levels of engagement in the labour market. These variations can be explored using our interactive data map. The ‘employment rate’ of any given group of people is the ratio of employed individuals compared with the total working-age population of that group. Data from the Annual Population Survey show that in 2016 the employment rate for the whole population aged 16 to 64 was 74 per cent. For white people it was 76 per cent, while for visible ethnic minorities it was 64 per cent. The lowest employment rate was for Pakistanis and Bangladeshis at 54 per cent. Indian people have employment rates comparable to white people at 73 per cent. Over the period 2004-2016 the white other group saw a significant increase in employment rate rising from 71 to 80 per cent, while the percentage of Black people in employment increased from 60 to 67 per cent. The Pakistani and Bangladeshi group saw the largest rise (10 percentage points) in employment figures over the same period. According to the 2011 census, of the 6 million members of the foreign-born population aged 16 to 64, 63 per cent were in employment, a slightly lower proportion than the UK-born population, 69 per cent of whom were in employment. For recent arrivals, employment is substantially lower at 53.2 per cent while those who have been here longer have rates more comparable to those born here. Notably, EU born immigrants have rates of employment higher than those born elsewhere and equal or even better the rates of the British born. For instance, 79.8 per cent of EU immigrants who have been here for 5 to 10 years were employed. Employment for non-EU immigrants who had just arrived was 42.9 per cent but for those who have been here the longest, the proportion is much more comparable to the native-born at 67.5 per cent. Self-employment, along with part-time working, can be viewed as an alternative to full-time employment but might also reflect restrictions on access to the desired kind of full-time employment. The 2011 census showed that in England & Wales, 8.9 per cent of people aged 16 plus and across all ethnic groups were self-employed. For the White British the rate was 8.7 per cent compared with 9.5 per cent of ethnic minority individuals. The White Other group had the highest rate of self-employment at 12.8 per cent. Pakistanis also had a high rate of self-employment at 11.2 per cent. Low rates of self-employment were observed for Black Caribbeans (6.1 per cent), Black Africans (6.2 per cent) and Bangladeshis (6.9 per cent). What is the employment gap? We define the employment gap as the difference between the percentage of White British and ethnic minority 25–54-year-olds in employment. Across all local authorities in England and Wales in 2011 (district and unitary), 307 out of 348 had an employment gap in favour of the White British. 17 had equal proportions of employment while 24 had a gap in favour of ethnic minorities. The average employment gap between the White British population and ethnic minorities was 5.2 percentage points. Also, there is variation in how different ethnic groups compare with the White British. For instance, for Pakistanis the average employment gap is 14.9 percentage points, for Bangladeshis it is 17.5 percentage points, while for the Indians and White Others it is −0.9 percentage points. The top six places where the employment gap is greatest are: Oldham, Bradford, Pendle, Kirklees, Gwynedd and Sheffield. The employment gap was highest in favour of ethnic minorities in West Somerset, Boston, South Holland, Bolsover and Blaenau Gwent. Where the employment gap was greatest there tend to be large proportions of Pakistanis and Bangladeshis not in employment. For instance in Oldham, only 53.6 per cent of Pakistanis and 50.1 per cent of Bangladeshis aged 25 to 54 were in employment. In London the average employment rate for the white population born in the UK is 74.8 per cent; the highest rate is found (thanks to the inflow of young professionals) in Lambeth and the lowest rate in Newham. The non-UK-born white population as a whole has a higher employment rate in London than the White British at 77.1 per cent and something similar is observed across the country. The UK-born non-white population has much lower employment rates across the UK and in London at 60.6 per cent, while the non-white population born abroad has a slightly higher rate at 62 per cent. The unemployment rate is the share of those who are economically active but are without work. The unemployment rate in 2016 according to the Annual Population Survey was 5 per cent overall. For White people it was 4 per cent while for ethnic minorities as a whole it was 6.5 per cent, rising to 8 per cent when the White Other category is removed. While the unemployment rate has been falling for all groups since 2013, it was highest among Pakistanis and Bangladeshis at 11 per cent. Black people and those of mixed ethnicity also had relatively high rates of unemployment at 10 per cent. Indians had a much lower unemployment rate at 5 per cent with the White other group at 4 per cent. Ethnic minorities are also slightly more likely to spend longer periods in unemployment compared to the White British. Economic inactivity is the term given to those who are neither in work or actively seeking employment, including students. In 2013 according to LFS data, the inactivity rate was 22 per cent. For white people it was at 21 per cent. Bangladeshis and Pakistanis had the highest rate of inactivity at 39 per cent, mostly accounted for by Bangladeshi and Pakistani women of whom 59 per cent are inactive; for Bangladeshi and Pakistani men the inactivity rate stands at 20 per cent. According to the 2011 census of England and Wales, those who speak English either as their first language or speak it well as a second language are more likely to be in employment than those who lack English proficiency. Those who are non-proficient in English are more likely to be economically inactive and 41.2 per cent of economically inactive people who cannot speak English well were taking care of family and home. Of those who cannot speak English well, 46.2 per cent have no qualifications. There is very little difference in educational profile between those with English as their first language and those who speak it well as a second language. Levels of English proficiency appear to have a greater impact on female employment rates than on those of men, but it is difficult to disentangle English proficiency, ‘migration’ effects and cultural factors when analysing these data. In 2011 employment rates for people whose first language is English averaged at 71.9 per cent (75.5 per cent for men and 68.3 per cent for women); for speakers of English as a second language the unemployment rate was 65.1 per cent (72.3 per cent for men and 58.3 per cent for women). A study at University College London found that low labour force participation among Bangladeshi and Pakistani minority groups is seldom a result of inability to find work or employer discrimination but ‘largely due to their lower readiness to participate in the labour market’. The graph below shows the extent to which their economic inactivity is accounted for by women. While Bangladeshi and Pakistani women have lower overall employment rates than Indian women, Muslim Indian women have lower employment rates than the non-Muslim Indian majority. Shamit Saggar has stated that ‘it goes without saying that higher levels of female economic activity are a major factor in helping minorities avoid poverty and access better opportunities’. Indian, Pakistani and Bangladeshi women are all increasingly becoming more economically active. However, there are big differences between the groups: as Saggar has observed, the level of female economic activity, is a ‘feature of the Pakistani community that has changed only modestly’ while ‘Indians report exceptionally high rates of female employment driving significantly better outcomes’. In 1993, 40 per cent of Indian women were economically inactive, but this figure declined to 30 per cent in 2013. Indian women are much more likely to be economically active than Pakistani and Bangladeshi women but when we look only at the economically active, unemployment rates are comparable. Notably, since 2011 unemployment rates of Indians compared with Pakistani and Bangladeshi women have tended to track each other quite closely but have diverged more recently – for Indian women it has fallen to 6 per cent while for Pakistani and Bangladeshi women together it stands at 10 per cent. Pakistani and Bangladeshi women are often classed together in research because they seem to display much in common. When figures are disaggregated then some interesting distinctions start to emerge. An article in the Economist showed how both Pakistani and Bangladeshi women were increasingly entering into the labour market. In 2001 the economic activity rate of Bangladeshi women lagged behind Pakistani women but has converged since 2007, with the former catching up with the latter. If we look within the category of economically active women we see that while Bangladeshi women may have caught up with Pakistani women, at the same time the difference between the two groups of women in the probability of being unemployed has diverged since 2007 – Bangladeshi women are becoming more economically active but are not finding the same success as Pakistani women. Among economically active Indian women, Muslims and Hindus are more likely to be unemployed than Sikhs. All second-generation immigrants except Black Caribbean women are significantly less likely to be unemployed than first-generation immigrants. According to the 2011 census, 3.9 per cent of people are looking after family or home; 3.4 per cent of White British people do so compared with 6.5 per cent of ethnic minority individuals. Rates are especially high among Pakistanis and Bangladeshis (15.2 per cent and 15.9 per cent respectively). The proportion of young people classified as NEET (not in employment, education or training) varies by age, ethnicity and religion. For the main ethnic minority groups and for Muslims, the proportion of NEETs grows across age cohorts.6 This can be interpreted to mean that as such young people move on from A-levels and from completing undergraduate education they do not go on to find opportunities in the same way as the majority. In 2015, after key stage 4 (at age 16), it is youth from Roma (24 per cent), and Black Caribbean (8 per cent) backgrounds who are most likely not to go into education, employment or training. Chinese and Indians are the least likely (1 and 2 per cent respectively). At key stage 5 (at age 18) this remains the case with figures of 17 and 11 per cent respectively for Roma and Black Caribbeans, however other groups also show increases. Those with mixed ethnicity and Pakistanis both have a higher than average rate at 10 per cent. The White British rate is 9 per cent while Indians (6 per cent) and Chinese (3 per cent) remain the lowest. White people are more likely to go into employment after graduating with their first degree than non-white ethnic minority groups: in 2013, 93.2 per cent of white graduates (who completed a full-time degree) were in employment in the first 6 months after graduating compared with 86 per cent of black and 87 per cent of Asian students. A more detailed study from 2006 found that unemployment for white graduates immediately after graduation stood at 5.5 per cent while for all non-white ethnic minority groups it was 9.7 per cent. Relatively high rates were found among people of Black African descent (11.6 per cent), Pakistanis (11.7 per cent), Bangladeshis (11.6 per cent) and the Chinese (10.3 per cent). Ethnic minorities, excluding the mixed category, are less likely to be trade union members than White British employees. The Department for Business, Innovation and Skills has found that black employees are most likely to be unionised, including the group with the highest rates of membership in Britain – Black or Black British women, at over 30 per cent (reflecting their strong presence in the white collar public sector). White British employees are also relatively likely to be unionised with the rate for men and women falling between 20 per cent and 30 per cent of their share of the workforce. Ethnic minority Britons have a poverty rate almost twice as high as the White British and thus draw more heavily on the social security system. Arguments about relative fiscal contribution focus on immigrants rather than ethnic minorities and are inconclusive. 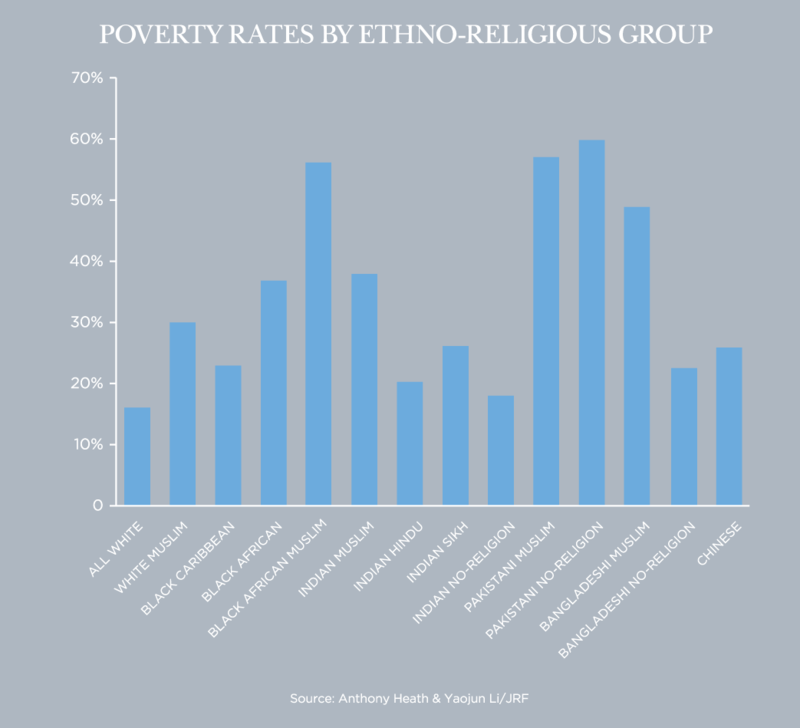 Poverty affects some ethnic groups more than others. 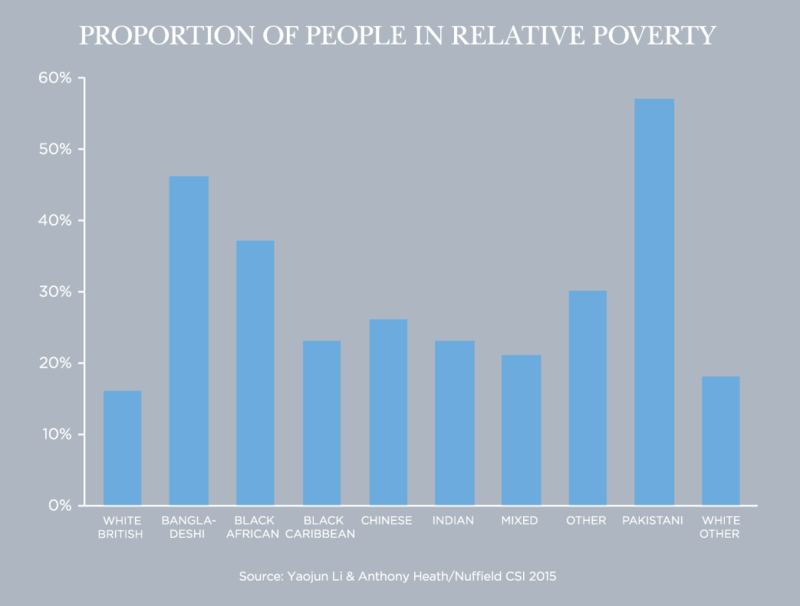 As shown in the graph below, ethnic minorities tend to have higher proportions in poverty than the White British. Rates are the highest for Bangladeshis and Pakistanis. Bangladeshis have not only a high poverty rate but also the lowest levels of internal inequality. Caribbeans also had high poverty and low inequality. The Chinese have a relatively high poverty rate but high inequality: many Chinese are on high incomes. A similar situation was observed for Indians, although the inequality was less pronounced. Poverty is not just a question of ethnicity – religion needs to be factored in too. Li and Heath found that Muslims tended not only to have higher rates of poverty but also within ethnic groups they tended to demonstrate greater poverty than other religious groups, as can be seen in the graph below. Indian Muslims for instance have more exposure to poverty than Indian Hindus and Sikhs. The one exception is when comparing Pakistani Muslims with those Pakistanis who have no religious attachment; between these groups there is little difference. While Muslims are more likely to be in poverty than all other religious groups, poverty rates drop dramatically across generations of immigrants. 54 per cent of Muslim 1st generation immigrants experience poverty, compared to 48 per cent of 2nd generation, and 25 per cent of 3rd generation Muslim immigrants (i.e. those whose parents were born here). Language is also something associated with poverty. Research by Paul Fisher and Alita Nandi for the Joseph Rowntree Foundation found that for all ethnic groups, speaking English as a first language was associated with a reduction in the likelihood of being in poverty by 5 percentage points. Ethnic minority groups are more likely than the White British to live in deprived neighbourhoods. However, the proportion of ethnic minority groups living in the most deprived areas has decreased between 2001 and 2011. One in three Bangladeshis and Pakistanis still live in deprived areas. These relationships can be explored geographically using our interactive deprivation map. The Wealth and Assets Survey for 2006/8 and 2008/10 demonstrated that Bangladeshi and Black African groups had the lowest levels of wealth of any ethnic groups, while Muslims were the poorest of any of the major religious groups with median net wealth of £42,000 per household in 2006/8. The wealthiest religious group was Jewish people with a median net wealth of £422,000, while Sikhs came second at £229,000, followed by Christians (£223,000) and Hindus (£206,000). Those who reported no religion had a median net wealth of £138,000, and are found at the very end of the spectrum. Respondents to the Family Resources Survey8 were asked to estimate the value of all bank accounts and financial assets they might have (excluding housing). The mean amount for all ethnic groups was just under £1,200. For the White British, the mean was £1,269 compared with £816 for ethnic minorities. Indians on average have more wealth – a mean of £1,399. 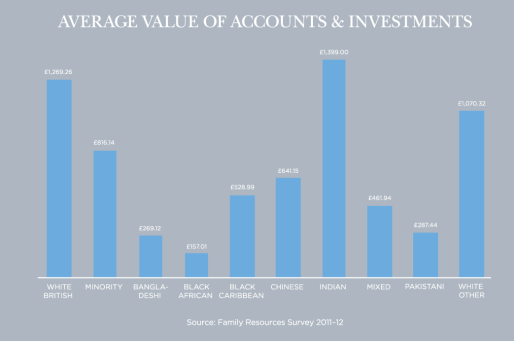 The ethnic group with the lowest value on average is Black African (£157) while Pakistanis (£287) and Bangladeshis (£269) also reported lower wealth. Of the top 50 in the Times Rich List 2014 a little less than half are of White British origin. They are followed by 15 in the White Other group, five Indians, five from other ethnicities (such as Arab), and one Chinese billionaire. Fully half (150) of the top 300 richest people in the UK are non-White British according to the Times Rich List 2014. 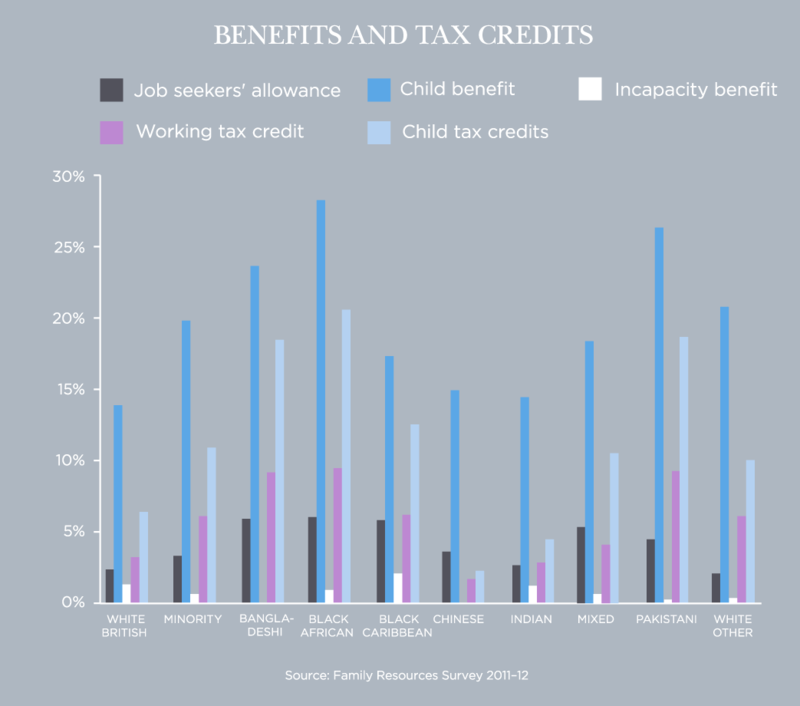 Receiving benefits varies by ethnicity and in general ethnic minorities are more in receipt of the major state benefits than the White British. According to the Family Resources Survey of 2011/12, 2.4 per cent of the White British were claiming Jobseekers’ Allowance (JSA), 14 per cent were claiming child benefit, 3.3 per cent working tax credits, and 6.4 per cent child tax credits. How does this compare to ethnic minorities as a whole? 3.4 per cent of ethnic minorities claimed JSA while 20 per cent claimed child benefit. 6.2 per cent claimed working tax credits, while 11 per cent claimed child tax credits. The ethnic groups with the highest proportions of people claiming tax credits are: Pakistanis, Bangladeshis and Black Africans. The minority groups with the lowest proportions of people receiving tax credits were the Chinese and the Indians. 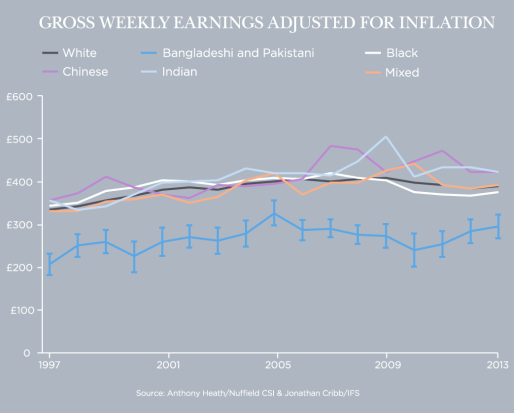 Research by Platt found 19 per cent of white households (meaning all white and not just the White British) were in receipt of income-related benefits (including things like council tax benefit, housing benefit, income support) compared to 14 per cent of Indian, 30 per cent of Pakistani/Bangladeshi, and 29 per cent of black households. 12 per cent of white households were reliant on housing benefit compared to 5 per cent of Indian, 12 per cent of Pakistani/Bangladeshi, and 22 per cent of black households. Concerning non-income related benefits (including child benefit, incapacity benefit, winter-fuel allowances etc. ), Platt’s research showed that 57 per cent of white households were in receipt compared to 44 per cent of Indian, 54 per cent of Pakistani/Bangladeshi, and 47 per cent of black households. Platt also analysed the proportion of income shares that were down to benefits. On average, 23 per cent of Pakistani and Bangladeshi household income came from either tax credits or benefits compared to 6 per cent of white households, 6 per cent of Indian, and 14 per cent of black households. Looking at recent immigration, there is wide variation in welfare claims. According to an IPPR report from 2007 only one per cent of Polish households were then claiming income support compared with 39 per cent of Somali households. Receipt of benefit is especially high among Pakistanis, Bangladeshis and Black Africans. The figures for Indians and Chinese are closer to those of White British people. 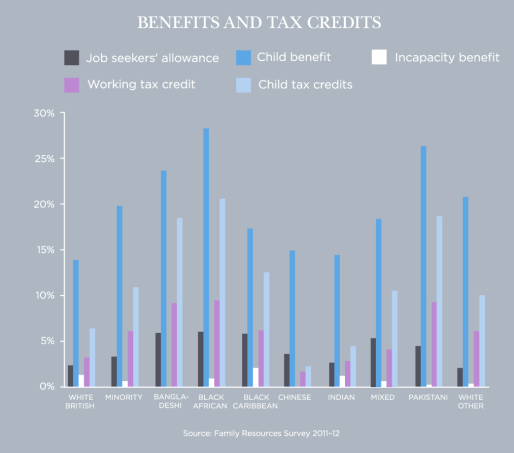 Lucinda Platt has identified apparent ethnic penalties in access to social security benefits and other financial support while the Daycare Trust found that ethnic minorities are less likely to take up tax credit support for childcare. The Budget of 2015 is predicted by some to have a negative impact on ethnic minorities. The budget saw restrictions made to the eligibility thresholds for claiming tax credits. The income threshold for tax credits was lowered from £6,420 to £3,850 while tax credits and universal credit can be claimed for the first two children in a family but not for subsequent births. Working age benefits are to be frozen for four years while the annual household benefit cap will be lowered from £26,000 to £20,000. 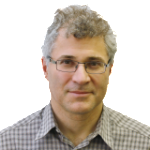 Omar Khan of the Runnymede Trust has argued that because ethnic minorities are overly-represented among welfare recipients and tend to have larger families, more than 1.2 million ethnic minority households could be worse off. In particular, Bangladeshi and Pakistani households would be hardest hit. There is no consensus on how to calculate fiscal contribution and even less on what the conclusion should be, though most of the analyses in the 2000s concluded that the fiscal impact was broadly neutral. More recently debate has focused on a 2013 paper (revised in 2014) from the UCL Centre for Research and Analysis of Migration (by Christian Dustmann and Tommaso Frattini), which was widely reported as showing the positive fiscal contribution of immigrants. In fact in the revised paper published in 2014 it found that immigrants as a whole (regardless of when they had come to the country) made a negative contribution of between £114 billion and £159 billion in 1995 to 2011. This is proportionately a somewhat larger deficit than the roughly £600 billion deficit of the established, non-immigrant population in the same period. The fiscal story is a narrowly positive one, according to Dustmann and Frattini, if you focus just on immigrants who have arrived since 2000 and on those arriving from the European Economic Area. Immigrants from central and Eastern Europe are narrowly fiscally positive and from the ‘old’ EU countries much more significantly so. DTI, Success at Work: Protecting vulnerable workers, supporting good employers, London: Dept of Trade and Industry, 2006. Hales J et al, A Test for Racial Discrimination in Recruitment Practice in British Cities, NatCen for the Dept for Work and Pensions, Research Report No 607, 2009. 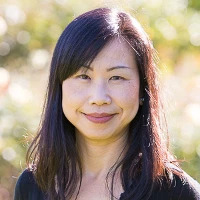 Heath AF and Cheung SY, Ethnic Penalties in the Labour Market: Employer and discrimination, DWP Research Report No 341, London: Dept for Work and Pensions, 2006.